“One good mentor can be more informative than a college education and more valuable than a decade’s income.” When starting any new career, one important asset to have is someone showing you the ropes. Whether it is introducing you to your new colleagues or helping you to learn the style of your new business; No matter what, a mentor or manager will always be there to help you along. Starting a new job is always difficult because you have no idea what to expect. When you’re an intern, it is especially difficult because you want to make a good impression and stand out. Without any direct support, how would you accomplish that? 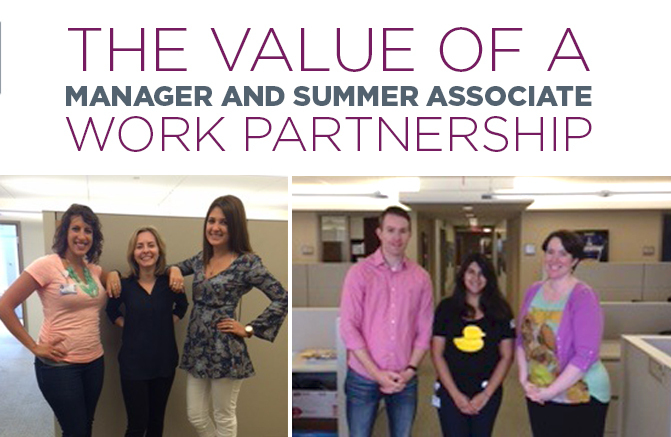 You wouldn’t – that is why every Summer Associate has a manager and a mentor! However, a manager should do more than just be willing to answer your questions; they should be willing to push you and help show your true potential. An internship with UPMC isn’t one where you fetch coffee and print documents every day. Here you have real projects and real deadlines. Your manager will give you a project that might be something you have never done before, but that is only because they believe you can handle it. And nine out of ten times you can, especially when you ask questions. Mandie often gave me projects that were pretty important and I was able to complete those by asking questions when I was confused. She was never unwilling to help! Managers are also here to help further you along in your career. You can learn a lot by sitting down with your manager and just asking them how they ended up where they are now. Most of the time those stories involved one or two bumps in the road but they still ended up pretty well off. Having the experience they do, they are willing to help you avoid some of those career obstacles. You can sit down with them to revamp your resume, LinkedIn, or your portfolio. All you need to do is ask! I couldn’t have asked for a better manager than Mandie. She was willing to answer any questions I had throughout the summer and never hesitated to give me more work when I asked for it. She gave me more responsibility and advice than I was expecting to get as a Summer Associate. A relationship with your manager can last longer than just your summer at UPMC, if you keep in touch. You never know, maybe one day they will be able to help you get your dream job at UPMC!